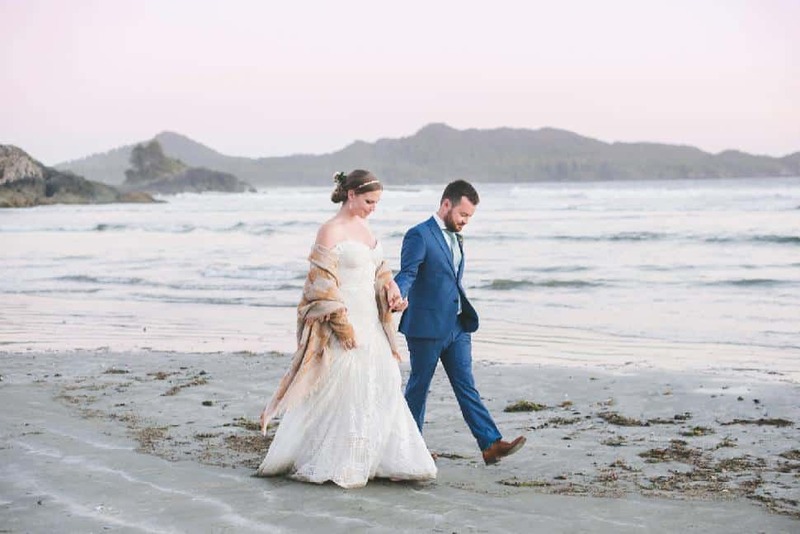 So after a surprise proposal featuring a romantic note on the door (“Home to me is wherever you are”), a candlelit hallway and Ben’s great-grandmother’s ring, it was only natural that the engaged couple chose their island getaway for an intimate, 65-person wedding. 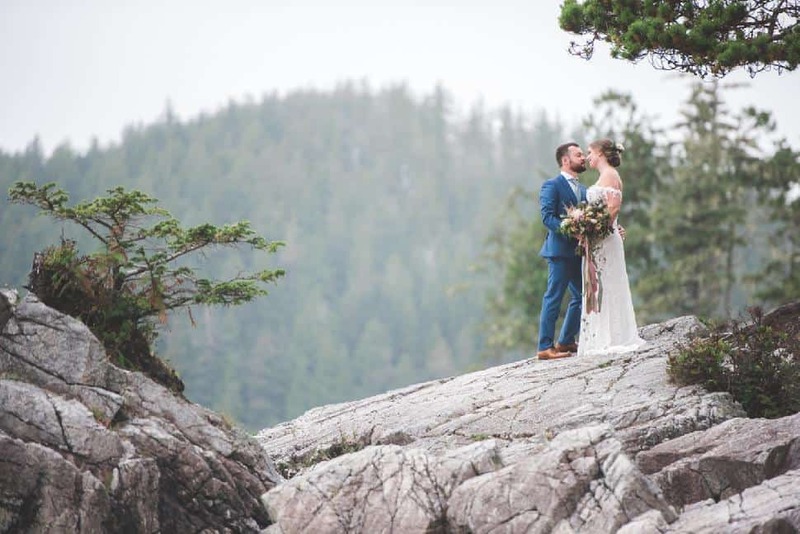 Keeping the event in B.C. 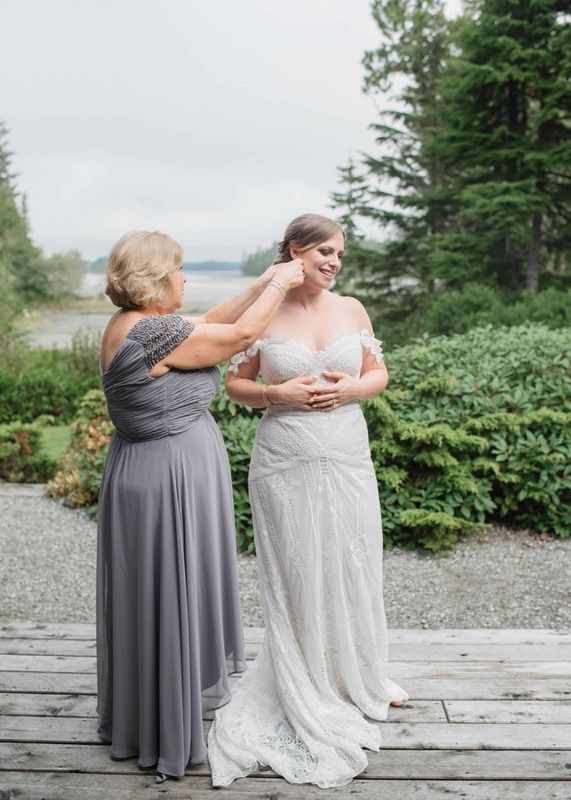 also enabled Robyn’s grandmother to attend. 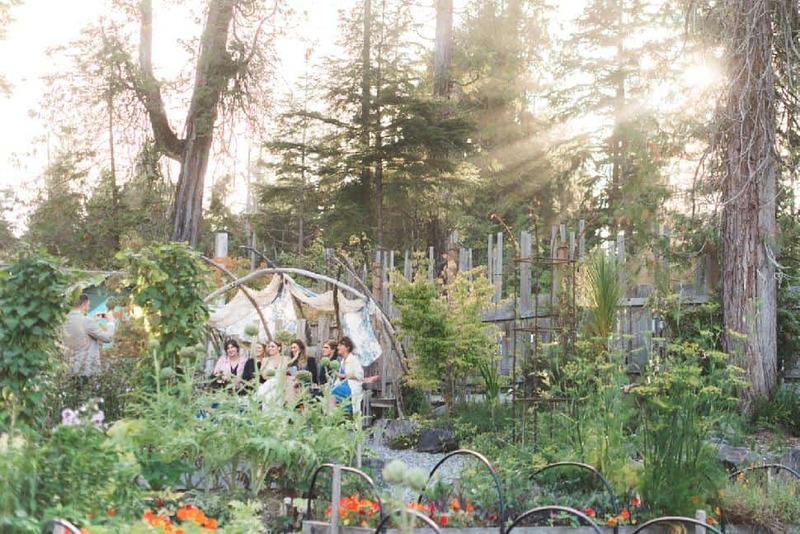 “I thought, we should get married here and now while my grandma’s still around,” she explains. 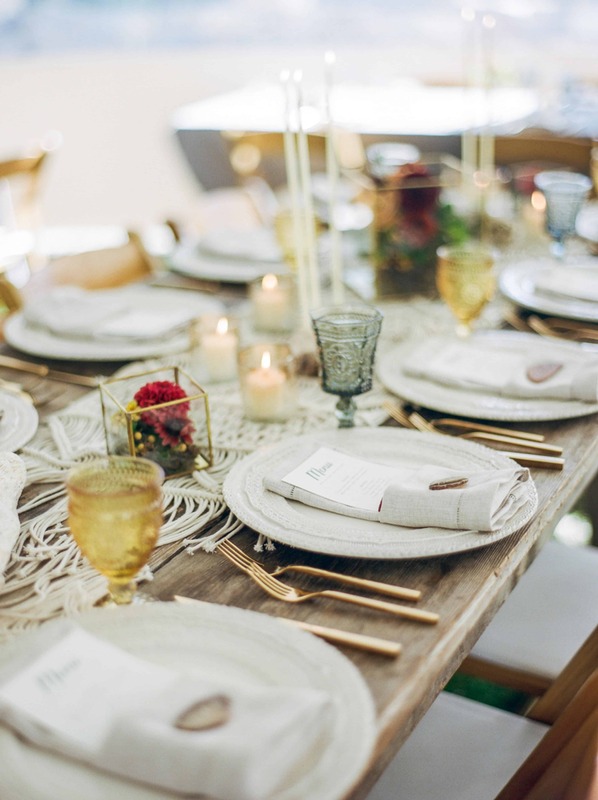 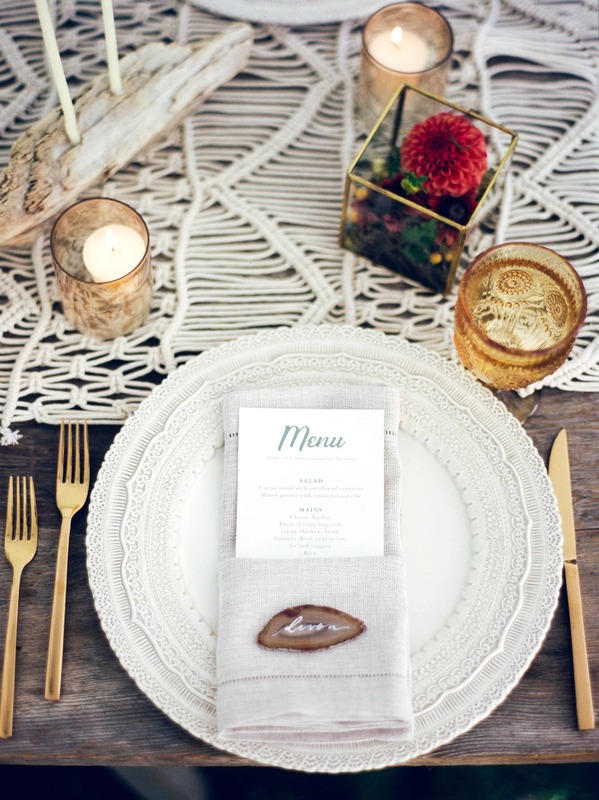 With just a vague idea of their theme (“I didn’t have a Pinterest account ready to go,” laughs Robyn), the couple trusted their planner, Aranza Grant of White Events, and the other vendors to tap into something that was one part bohemian, one part rustic, and totally them. 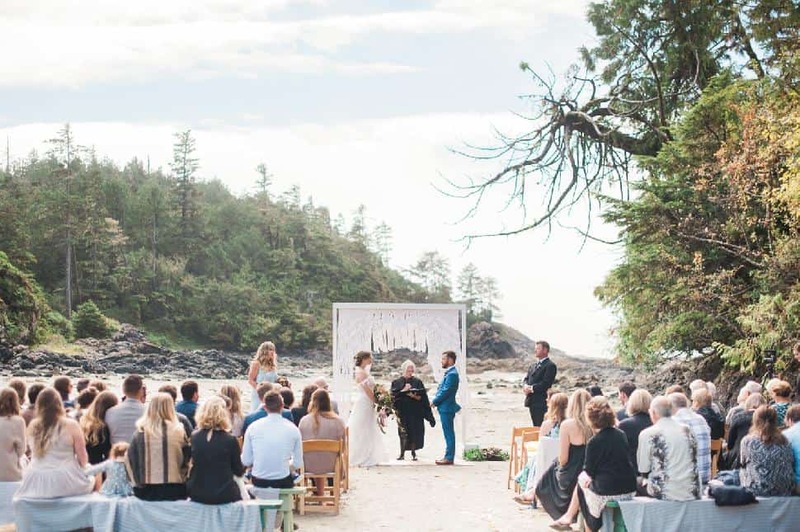 The plan: to have the ceremony on what Robyn calls Tofino’s “bigger-than-you” beach before tucking into the wilderness of Tofino Botanical Gardens. 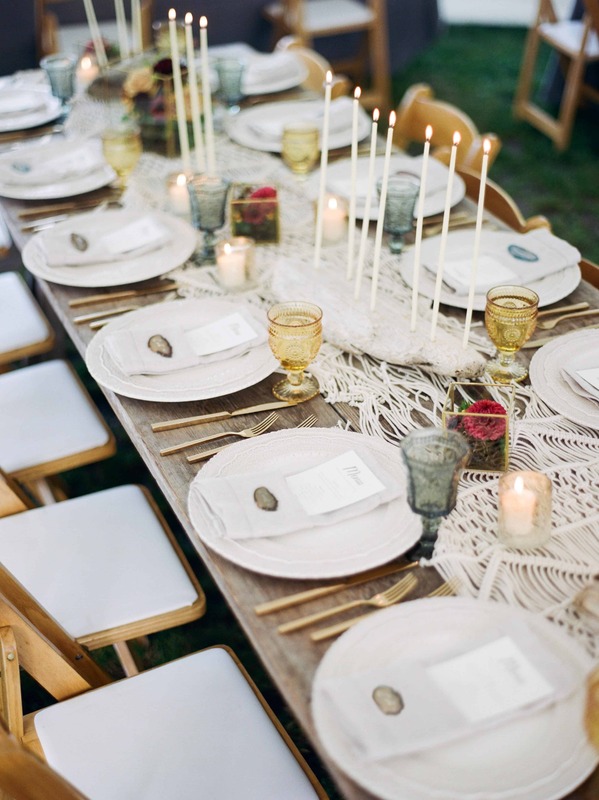 And with the help of a day-of coordinator from Rare Earth Events, the wedding went off without a hitch. 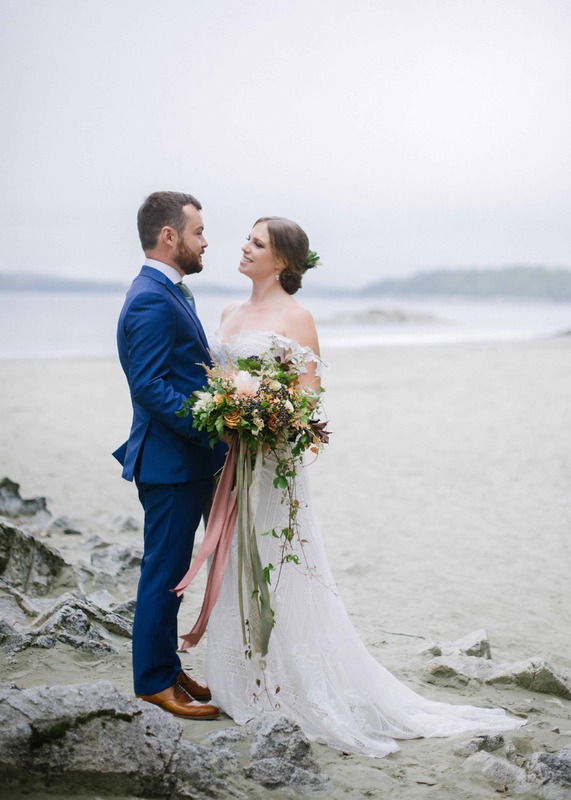 The couple exchanged vows on the beach before joining their guests in Tofino Botanical Gardens for a grazing-style cocktail hour along the forest path, featuring canapés by Tacofino and champagne. 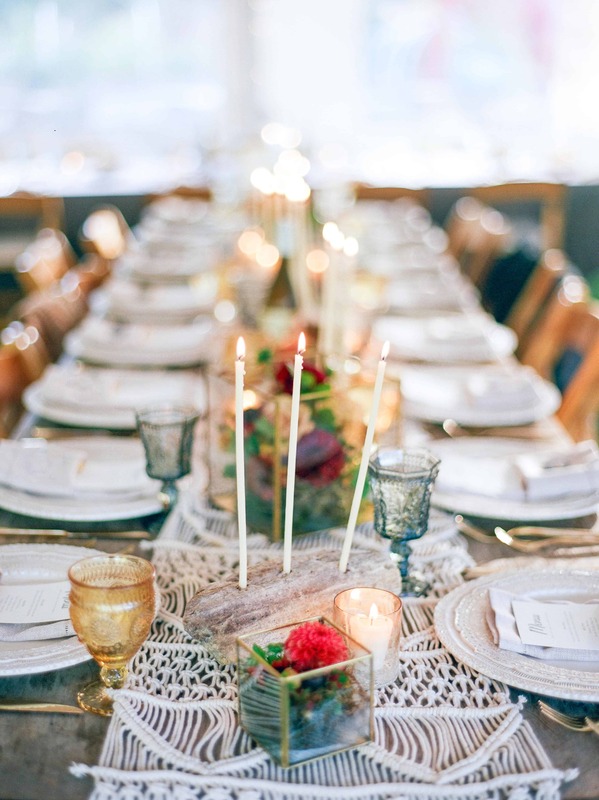 During dinner, the head table was stationed in the middle of the reception tent, surrounding Robyn and Ben with family and friends. 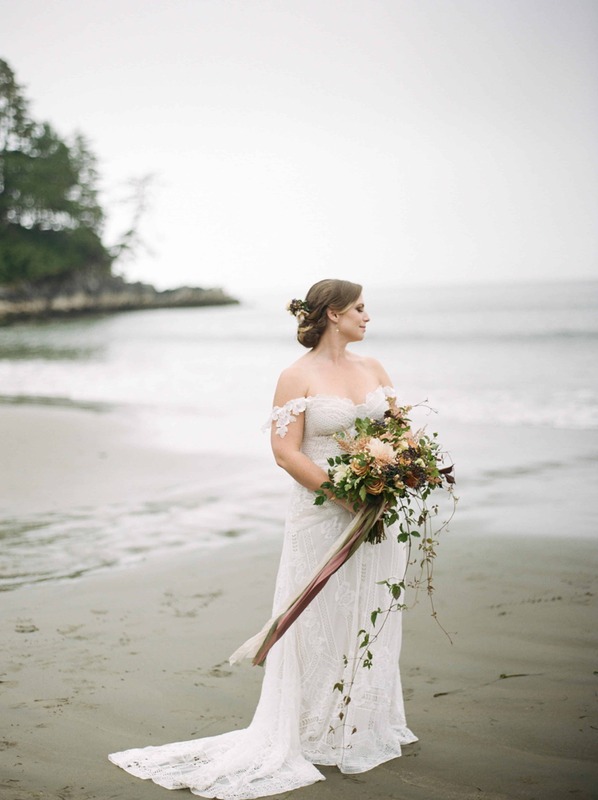 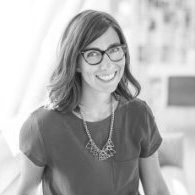 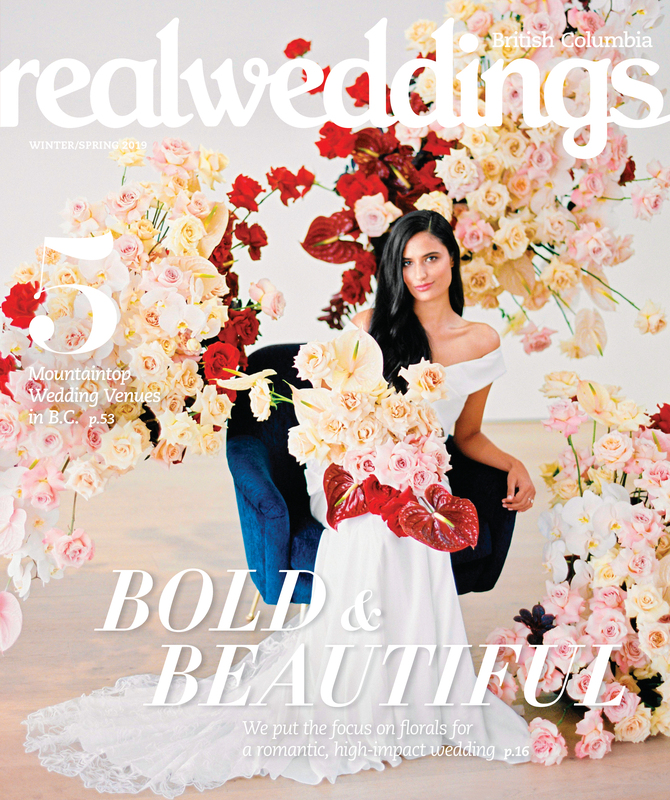 Robyn found her Rue de Seine Fox gown at Union Bridal, accessorizing with her grandmother’s hand-carved Indian bangles and blue Steve Madden pom-pom sandals (which she later swapped for blush-pink Reeboks). 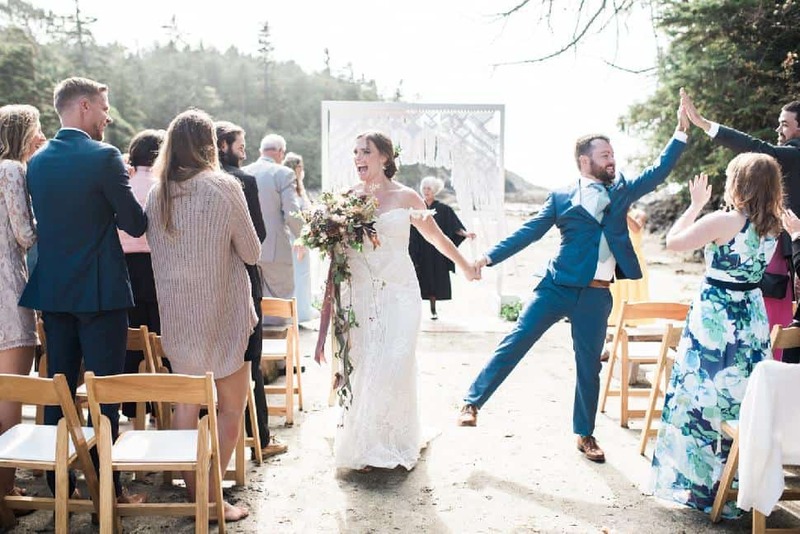 Ben, meanwhile, sourced his suit from Outlook for Men. 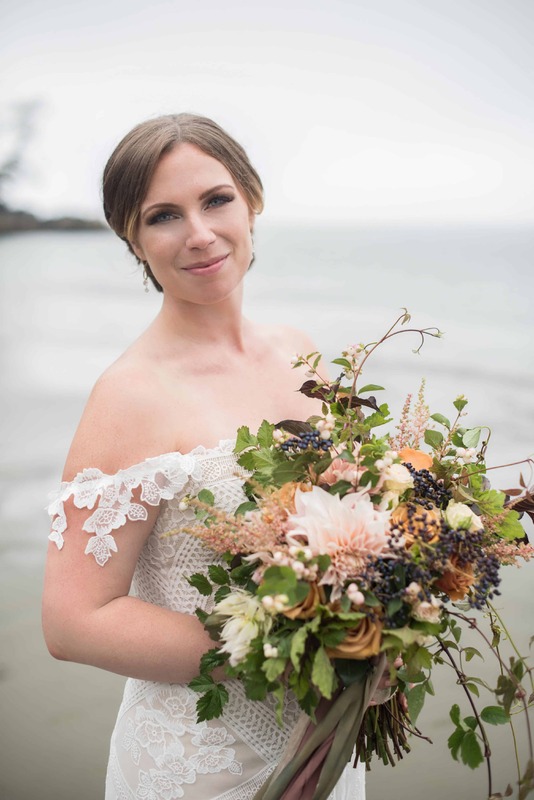 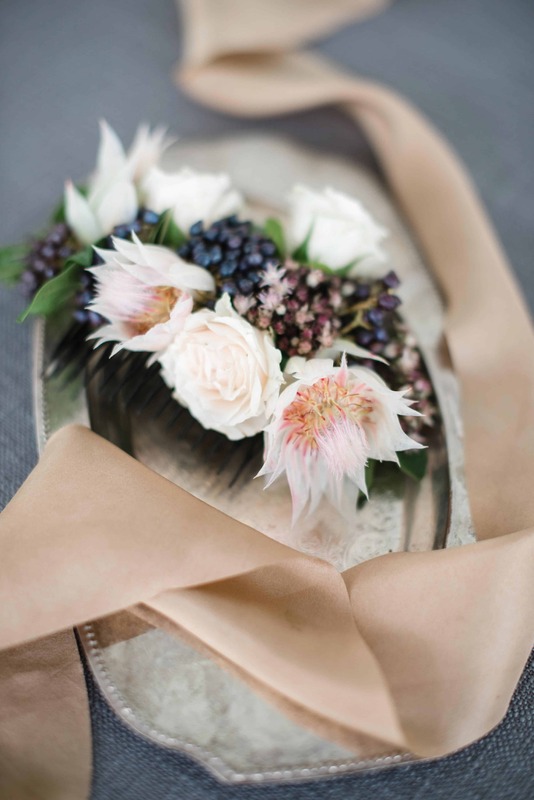 Victoria’s Verbena Floral Design crafted the bridal bouquet out of flowers sourced from Ninebark Farm in Metchosin—a stunning combination of soft pink dahlias, heritage roses, zinnias, greenery and apricot-gold roses finished with a pretty sage-coloured ribbon. 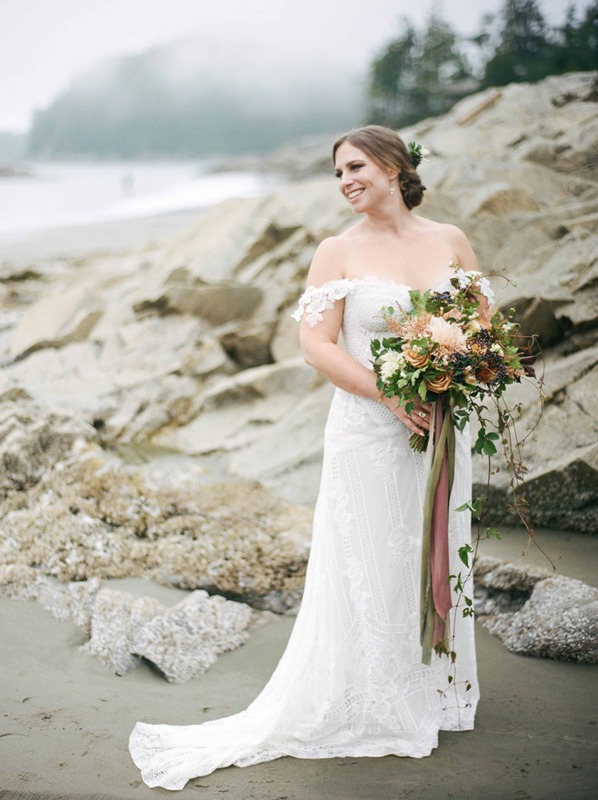 Robyn’s sister Devon Stanley is a hairstylist, so she did the bride’s hair, while Emmy Monk handled makeup. 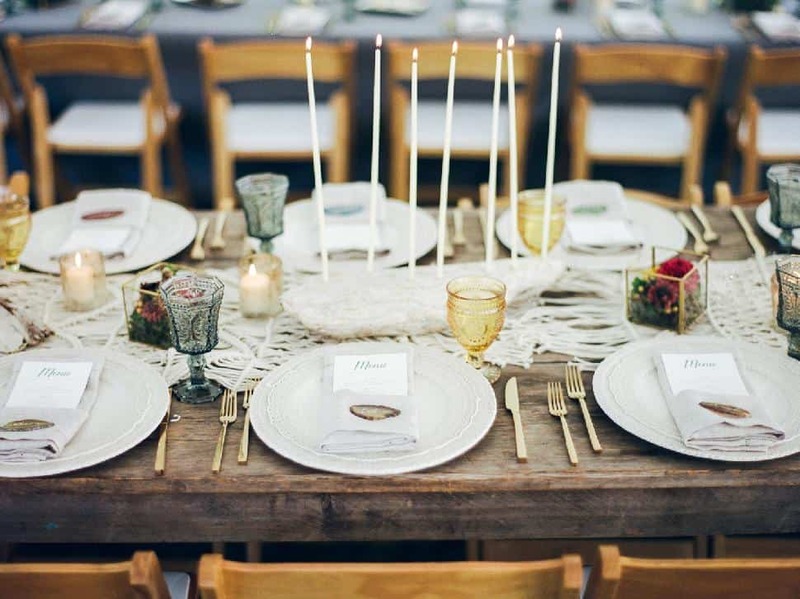 Small holes were drilled into slabs of driftwood and then fitted with tall, delicate, white candlesticks; the result is a stunning natural DIY centrepiece. 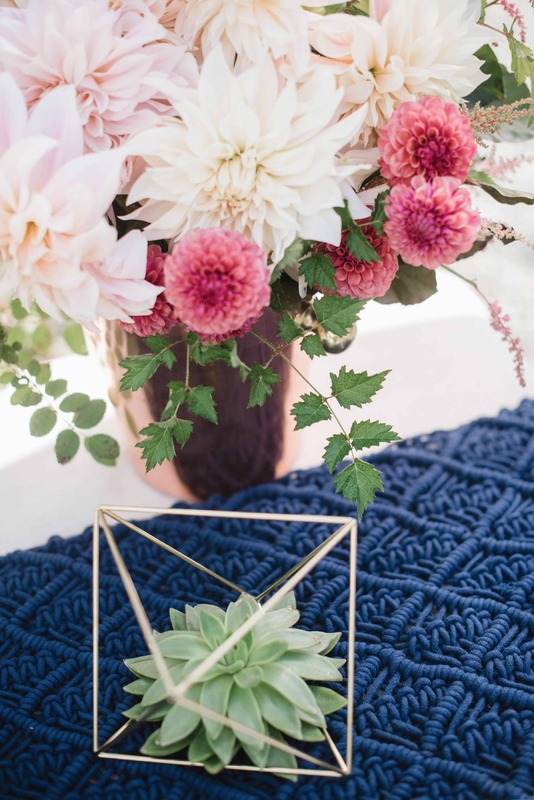 These sat on the tables atop macramé runners sourced from Trend Decor, who also provided the vintage-inspired drinking goblets and terrariums for the air plants and succulents brought in by Verbena Floral Design. 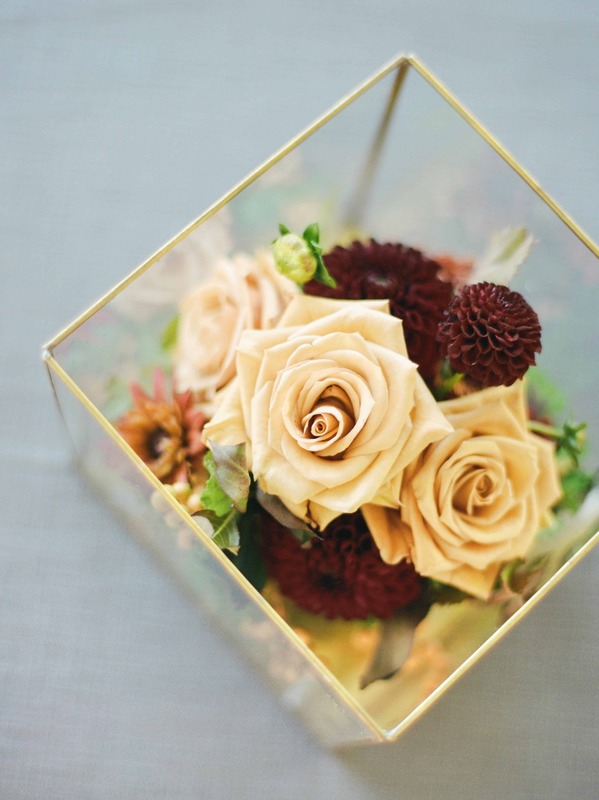 Floral arrangements were tucked into shiny rose-gold vases. 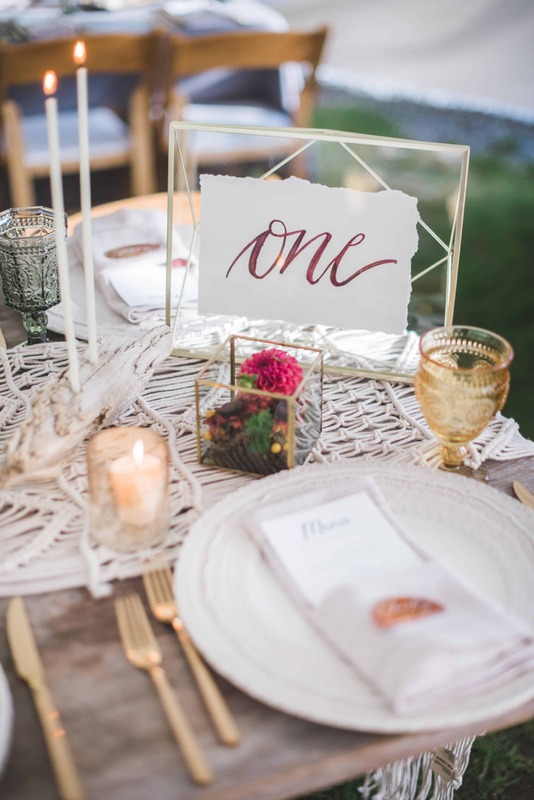 The place cards at the table were made from thin slices of agate, customized with looping gold-coloured calligraphy courtesy of friend Emma Allen. 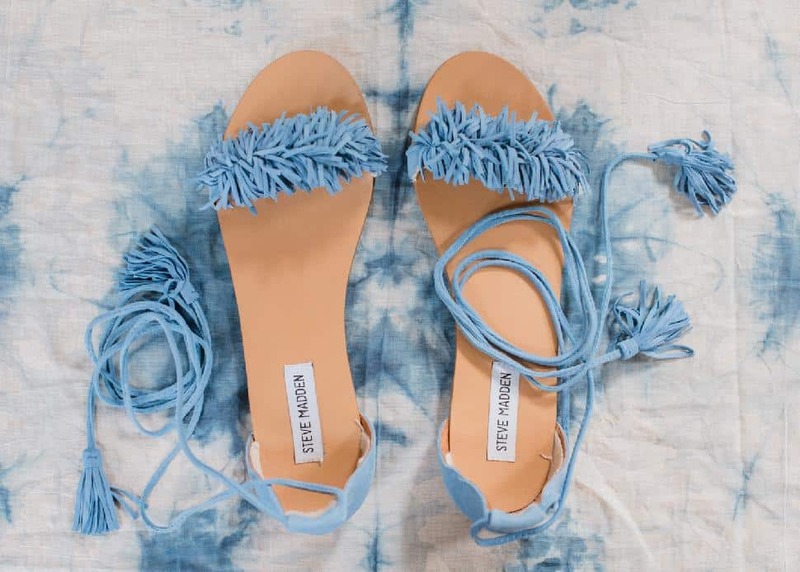 These pretty pieces also doubled as parting gifts. 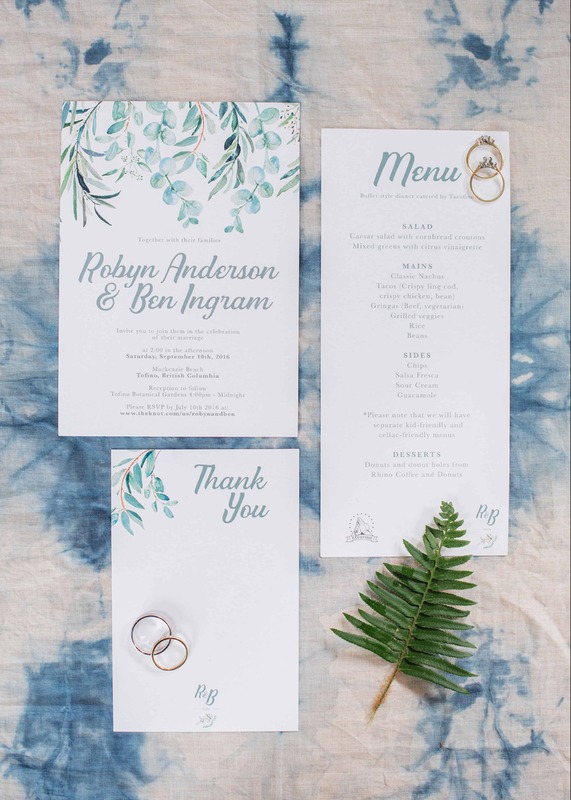 Robyn turned plain swathes of organic cotton into beautiful draped cloths with shibori, the Japanese art of tie-dying using indigo inks. 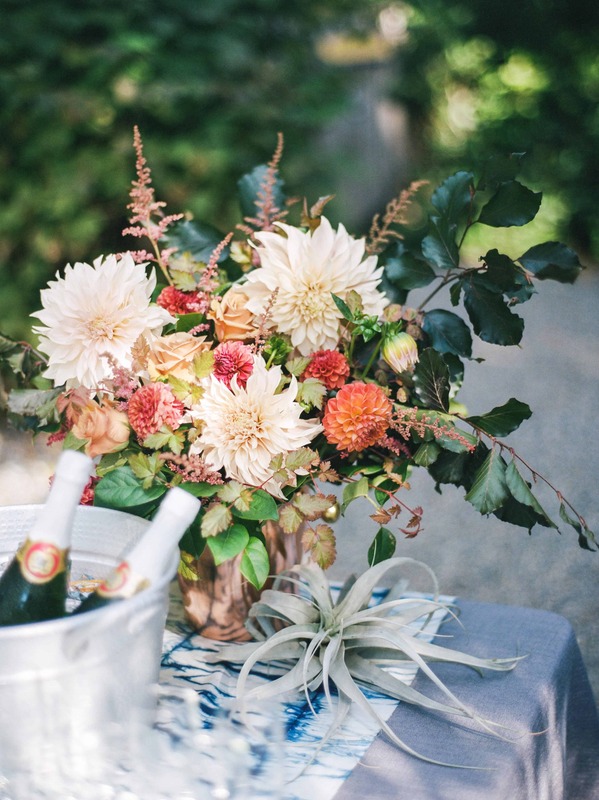 These artful fabrics added pops of colour to the tented lounge area in the garden. 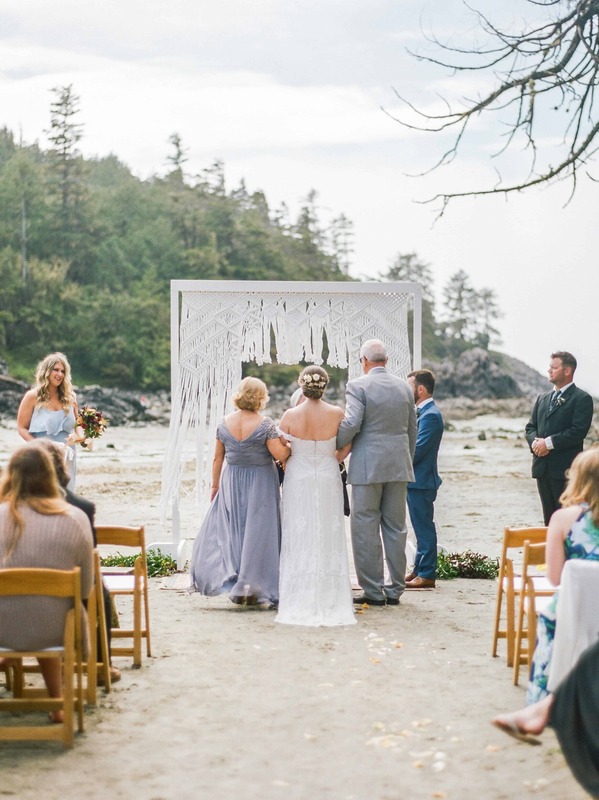 Friend of the couple and fibre artist Jolynn Vandam of Saige and Skye hand wove a macramé design to drape on the wedding arbour. 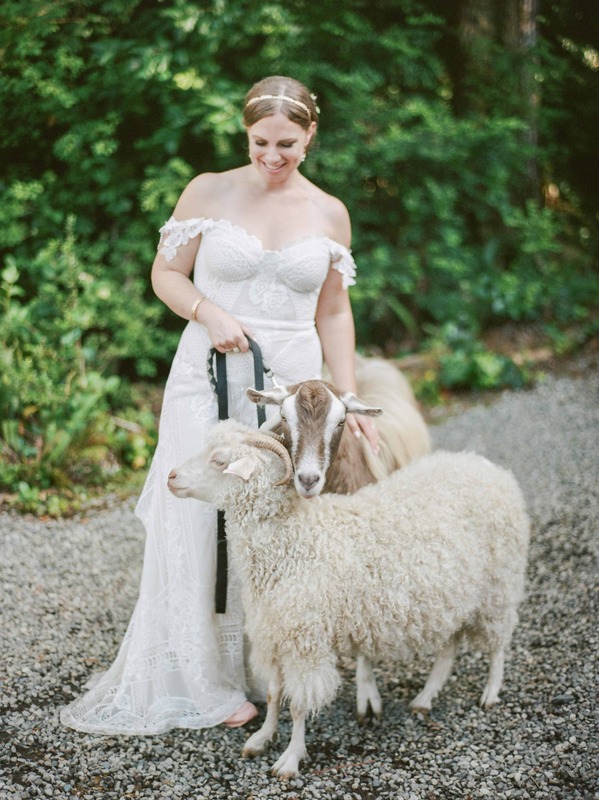 Ben and Robyn have a soft spot for goats, so they were delighted to discover there was a herd at the Botanical Gardens; they led out a few to surprise the guests during grazing hour. 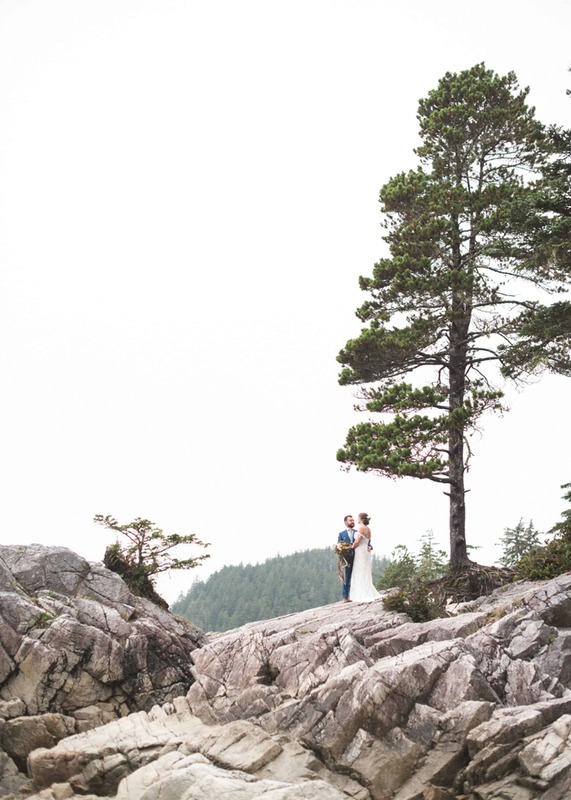 Instead of a guest book, friends and family signed a beautiful piece of wood custom-cut into the shape of Vancouver Island. 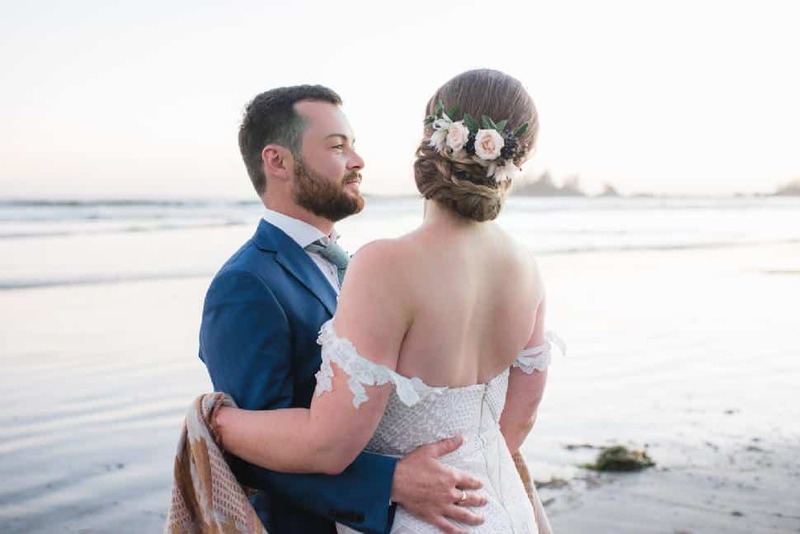 The couple set out their own antique rugs, blankets and cushions—and even an antique trunk—in the garden lounge to add a cozy, homey vibe.